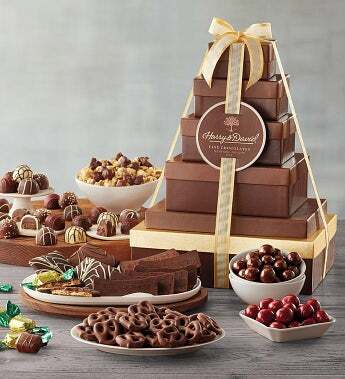 Regular includes: Dark Chocolate Moose Munch® Popcorn, 10 oz. ; Chocolate Cherries, 6 oz. ; Milk Chocolate Mini Mints, 2.43 oz. ; Dark Chocolate Maltballs, 6 oz. ; Signature Chocolate Truffles (Raspberry, All Dark, Coffee, Double Chocolate), 8 oz. Total Net Weight: 2 lbs.